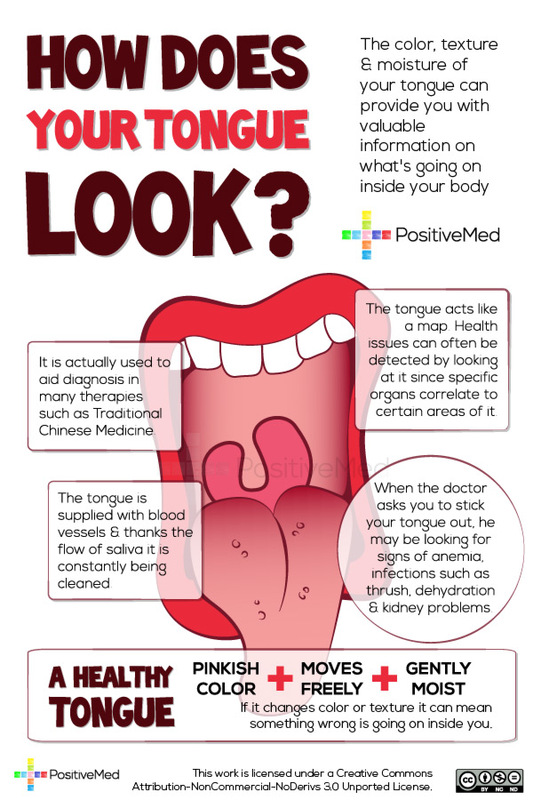 The color, texture and moisture of your tongue can provide you with valuable information on what’s going on inside your body; the tongue is actually used to aid diagnosis in many therapies, such as Traditional Chinese Medicine. The tongue is richly supplied with blood vessels, thanks to a constant flow of saliva, it is constantly being cleaned which discourages harmful bacteria forming in the mouth area, but if a person is unwell, a problem can often be detected by simply looking at the tongue, it acts like a map where certain areas of the tongue correlate to specific organs of the body or to detect a range of conditions. In fact we have seen it for a long time, when you go to a doctor’s appointment and he tells you to stick out your tongue, he may be looking for signs of anemia, infections such as thrush, dehydration and kidney problems. A healthy tongue is pinkish in color, moves freely and is gently moist with a light coating, but if it changes color or texture, it can mean something wrong is going on inside you. This entry was posted in Health and tagged circulation, disease, doctor, illness, information, toungue by Miss P. Bookmark the permalink.